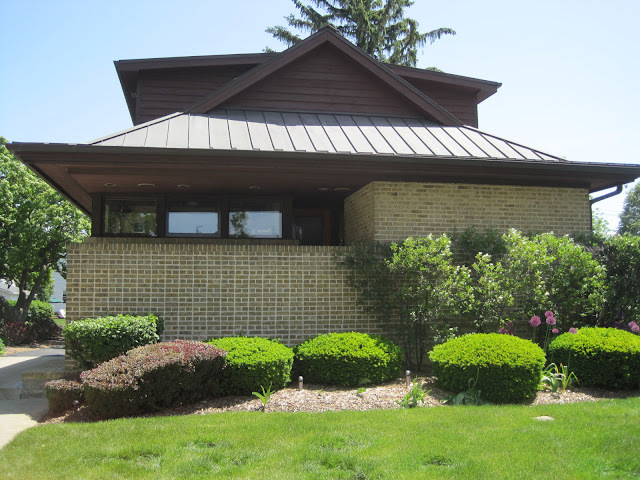 Recently I posted about a Mount Prospect house that allegedly was designed by a protégé of Frank Lloyd Wright, according to some longtime residents. Real estate ads of the era stated that the house was “designed by one of America’s foremost modern architects”. Paul Schweikher, a noted midcentury modernist, designed the S.W. Burda residence in 1940. 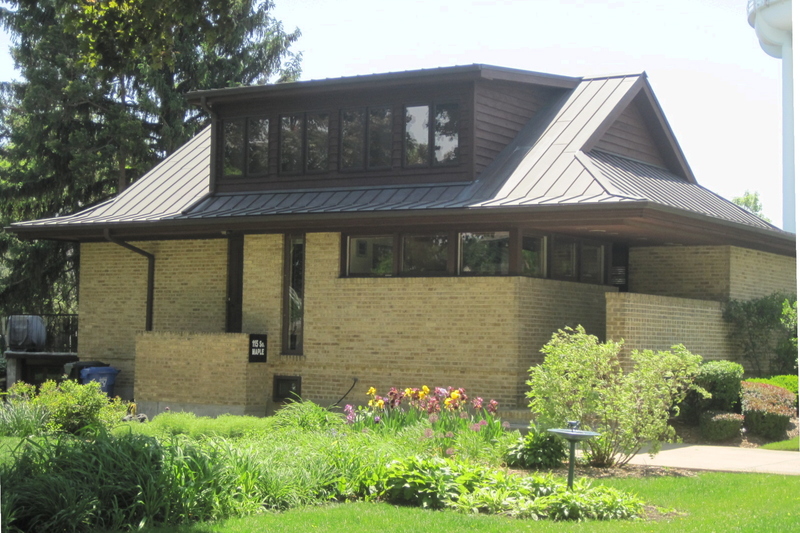 Schweikher never studied with or worked for Wright, but he was influenced (as were most residential architects of the time) by Wright and the Prairie School. The house in 2005 with wood shingles and a pagoda roof. 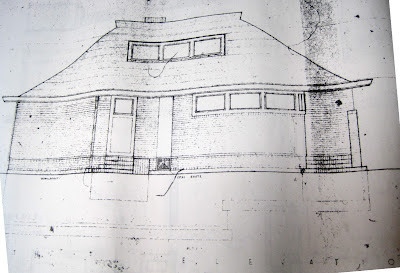 This was Schweikher's original design. Photo courtesy of Peter Austin. Schweikher had considerable influence on architectural design. He received widespread recognition with numerous awards and exhibits dedicated to his work. He was also influential in architectural education, chairing the departments of architecture at Yale University and Carnegie-Mellon University. 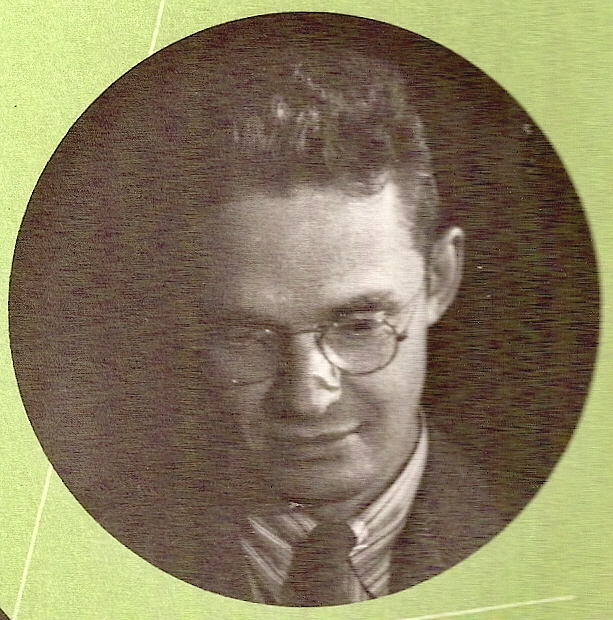 As a young man, he began working in the office of David Adler. 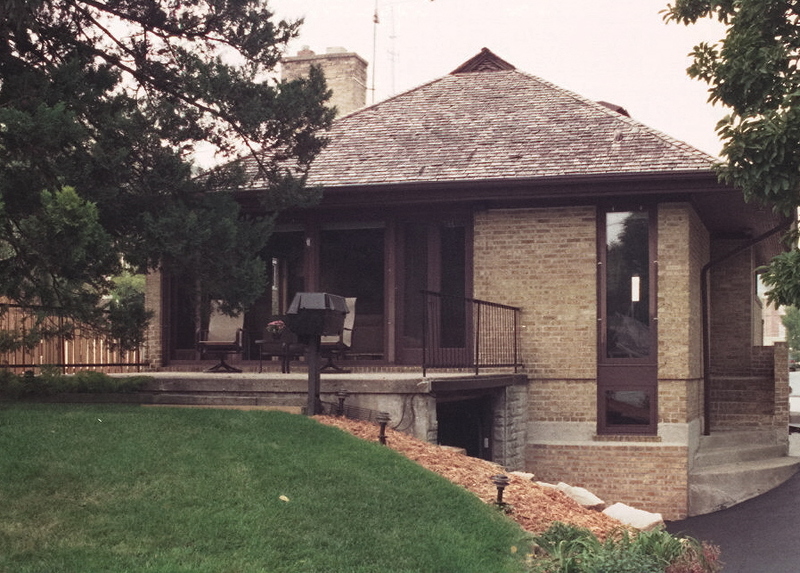 Schweikher built his reputation on residential designs. 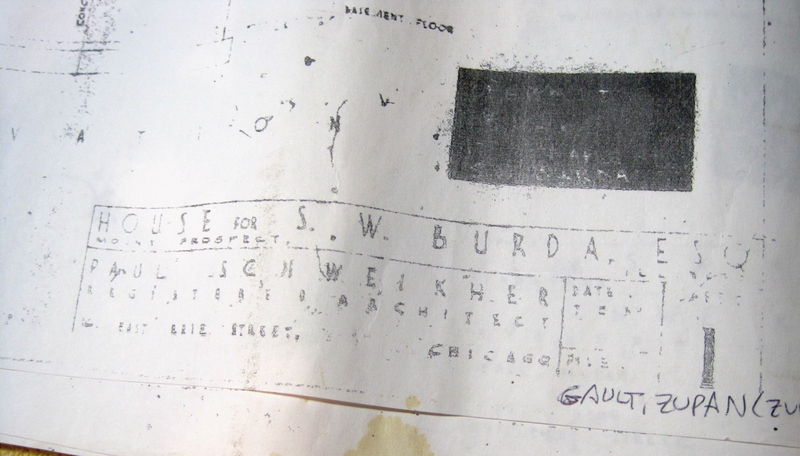 In 1934, Schweikher started his own architectural practice with a partner. His studio trained notables like Bertrand Goldberg, Edward Dart, and Ralph Rapson. Between 1935 and 1971, Schweikher designed churches, schools, and over 50 houses. His two most famous structures were his own residence in Schaumburg (a National Historic Landmark) and the Third Unitarian Church in Chicago. There are similarities between the S.W. Burda residence in Mount Prospect and the Schweikher residence in Schaumburg (built 1946) and the Rinaldo residence in Downers Grove (built 1941). The original owners of the Mount Prospect house were Dr. and Mrs. Stanley W. Burda and daughter Helen. In 1936, Stanley Burda opened Burda Drug Store, located on Northwest Highway. 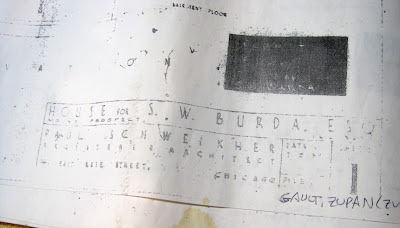 Business must have been good at the drug store, because in 1940 the Burdas hired Schweikher to design their house. Unfortunately, Stanley died of pulmonary hemorrhage in 1943. Mrs. Burda put the house up for sale later that year. The classified ads run at the time called the house a “5 rm. Calif. Moderne” but no mention of who the architect was. In 1944, Mr. and Mrs. Jack Cunningham bought the house. They moved out in 1945 and sold to Captain and Mrs. Vernon Gault. Fast forward to April 1988. Peter Austin, the current owner, purchased the home from Frank Zupan and his wife. The Zupans told Austin that the house was historically significant and special, but had no specifics to offer. 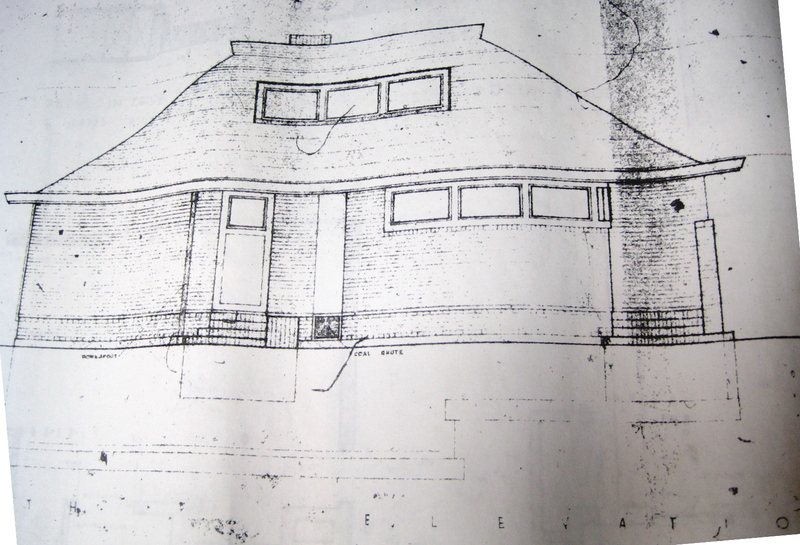 Austin went to the village and got a copy of the blueprints from 1940 that showed that Paul Schweikher was the architect. The original roof resembled a Japanese pagoda. There were often Japanese elements in Schweikher’s houses after he and his wife retuned from their first trip to Japan in 1937. The original dormers were much smaller than the ones on the house today. In 2005, Austin enlarged the dormers and altered the roofline to gain interior space that was desperately needed upstairs. The house before the remodel. Note the pagoda roof and the size of the dormer. Photo courtesy of Peter Austin. The house during the remodel. Photo courtesy of Peter Austin. Schweikher’s houses often had very few windows facing the street. The house on Maple has windows along the back wall, facing the yard. Rear view of the house. The garage was added to the house around 1945. Photo courtesy of Peter Austin. 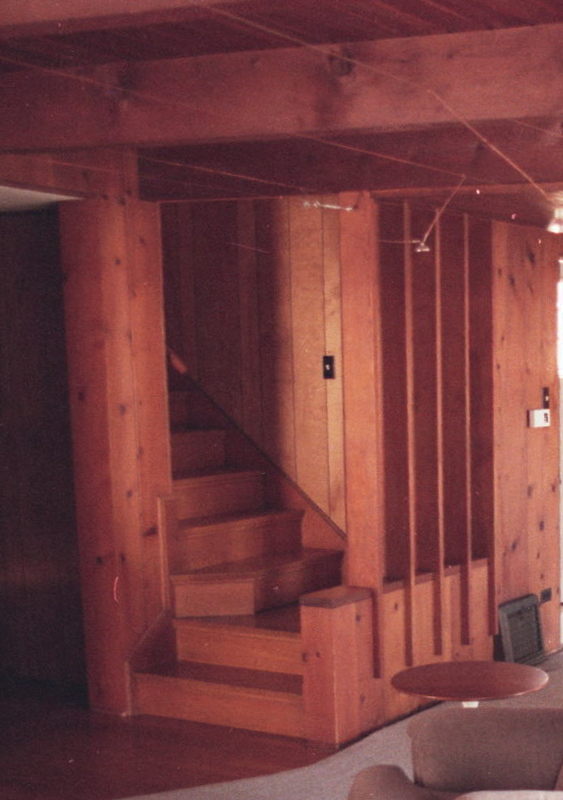 The original walls of plywood and Douglas fir panels remain through much of the house. The stairwell resembles the one in the Rinaldo residence. Photo courtesy of Peter Austin. Schweikher's houses often featured floor to ceiling brick walls in the living and dining areas. The living room resembles that in the Schweikher residence but on a smaller scale. Photo courtesy of Peter Austin. Built-in wood shelving is also typical of Schweikher. Shelving that is very similar to that found in the Rinaldo residence. Photo courtesy of Peter Austin. The S.W. Burda residence is arguably the most architecturally significant house in Mount Prospect. Fortunately, the current owner is proud of his home's history and is aware of the importance of keeping the original design as intact as possible. Amazing house and interesting story--thanks for the info! I really appreciate you posting these photos and acknowledging the work of Paul Schweikher. This is a great example of his work and his creativity. I wish Mr. Austin had hired a better architect though. I do not feel the remodel does the design justice. Many opportunities were missed and this work will be forever diminished. A better architect would have understood how to incorporate Japanese massing and details to produce a more fluid remodeling. I whole heartedly agree. Too often great works of architecture are diminished or even destroyed with extensions and or remodels that don't lend the sensitivity or knowledge on what a right approach might be. Or better yet,. why extend or remodel,.. if one wants a larger home or structure why not just build a new one? Well, nevertheless at least some of the original facade and interior are still intact, especially Schweikher's interesting use of materials such that of the masonry,.. always striking many of his designs.